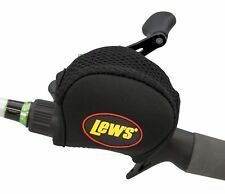 Lew's 4mm Neoprene Low Profile Baitcast Reel Cover Black NEW. Lew’s Speed Cover reel cover for low profile baitcast reels. Safely protects your Lew's baitcast reel while still on the rod. Quality hook and loop fastenings allow you to remove the cover quickly. Quality hook and loop fasteners provide easy on/off application. Lew's Logo on side. Protects your reel while still on the rod. Thick 4MM high density neoprene. High quality hook and loop fasteners. Multifunctional: perfect for storage baitcasting, drum, raft, spinning fishing reel, or small fishing accessories. Type: fishing reel bag. One-layer: one-layer design makes you find the fishing accessories you need easily and quickly. SHIMANO Neoprene Reel Cover, Baitcast. Protect your valuable conventional and bait casting reels with Shimano's new neoprene reel covers. The design allows for reel covers to be mounted while the reel is on or off the rod. This Reel Case has 6 movable dividers to hold up to 8 small fly reels/ spare spools/ accessories. Features a padded carry handle for comfort. Size: 10.23" x 6.2" x 3.93". Padded carry handle. Shimano Bhaltair Fishing Reel Storage Carry Bag. • New Shimano Bhaltair fishing reel bag. • We are an authorized Shimano dealer. • Hard sided durable textured fabric construction. • Adjustable and removable padded shoulder strap. Model: ANSC840A. (2)SHIMANONEOPRENE SPINNING REEL COVERS. Quality hook and loop fasteners provide easy on/off application. - Fits Size 300 and 400 Spinning Reels or size 30 or 40. 2LEW'SNEOPRENE SPINNING REEL COVERS. - Works on both right/left hand retrieve reels. ANSC840A - Fits Shimano Reel Sizes 2000-6000. Shimano Neoprene Spinning Reel Covers are designed to fit, whether the reel is on or off the rod. The new design allows these covers to fit right and left hand retrieve reels. Durable Casting Reel Case Protective Wheel Cover Baitcasting Fishing Reel Bag ..
An excellent protection for casting reel. Can be assembled on the fishing pole. Suitable for casting reels and left / right interchangeable fishing reels. Note: The fishing reel is not included. Fastener tape for easy storage or removal. The fly fishing reel bag can be used while the reel is attached to the rod. Loop tape fastener for easy storage or removal, well protecting your reel from shake. Light-weight and durable. Detail Image. This is an original ABEL reel bag with the original ABEL logo. Up for auction is a Alutecnos Neoprene Reel Cover. The auction is for 1 Reel cover. I have 4 available. The covers measure approximately 6x5. There are a couple marks on the color but there are no breaks or tears anywhere. This is of course from just normal use. They are all Neoprene with a velcro back. Feel free to email me with any questions. Good Luck! This leather reel case is a Leland case. Great for storing your reel. Super High quality, Surepro Reel Cover- Universal size. Eliminates reel and line tangle in rod lockers. Protects reel and line from sand, dirt, dust and the sun. Extends reel and line life. REEL PROTECTION. New reel cover in original packaging. Shipped USPS first class mail. This is a brand new Costal Conservation Association neoprene spinning fishing reel cover. It fits most right and left handed spinning reels. The one you will receive is in an unopened package. All my items come from a smoke and pet free home. Shipping, handling, insurance, and delivery conformation is FREE. Please pay by pay pal within 7 days of the auctions close. I accept pay pal only. Message me through ebay with any questions. I do not ship outside the US. Up for sale is a very nice Peerless fly reel case. This case is in good used shape and it works as intended. The inside has a diameter of approximately 3” (good for small sized fly reels). This case is of good quality. Please see all photos and thank you for looking. Protect your valuable casting reels with the neoprene cast Reel Cover, designed to fit left or right hand reels. � Neoprene Covers Stretch To Easily Slip On. WARNING WARNING:� This product can expose you to chemicals including TDI, which are known to the state of California to cause cancer and birth defects or other reproductive harm. Trending at $8.17eBay determines this price through a machine learned model of the product's sale prices within the last 90 days. FREE Shipping on ALL ITEMS When Combined with this BAG. 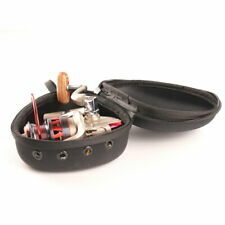 Shimano Neoprene Reel Cover Black Baitcast. The Neoprene Reel Cover protects your valuable conventional and baitcasting reels. It's designed to allow the reel covers to be mounted while the reel is on or off the rod. 5 Fishing Reel Bag. The bag can be used when the reel is on or off the rod. Good for both left hand and right hand reel. With fastener tape design, easy to use. Size: 11.5 11cm / 4.5 4.3in. Abu Garcia 60 Toro Reel (#REVO T2 S60)Specifications Abu Garcia 50 Toro Reel (#REVO T2 S50). 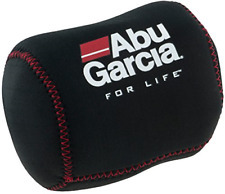 Protect your favorite Abu Garcia reels during storage and transport. Equipped with high quality hook and loop fasteners to hold the neoprene cover in placeThis Reel Cover Fits the Following Models. These Suede leather fly reel cases are lined with a soft synthetic fleece type material that are easy to keep clean and protects your favorite fly reels. Each Reel case closes with a heavy duty zipper and is perfect for keeping your reel in place. Our one-size fits all Reel Glove protects your expensive spinning reels. Durable, easy to put on, quality made Made from 4 way stretch neoprene with all edges finished for long life Fastens to your rod Fits both left and right hand reels Fits up to 3000-series spinning reels Specifications: Material: Neoprene Color: Black. Flat and stable base permits upright storage. Handle can be moved up or down for the perfect balance. Built out of high-density polyethylene, ABS plastic and aluminum tubing for long-lasting strength. Abu Revo Toro Reel Cover 50/60 Constructed from thick 2mm neoprene material, Abu Garcia neoprene reel covers are designed to protect your favourite Abu Garcia reels during storage and transport. Covers allow anglers to protect their reel without having to remove them from the rod. High quality hook and loop fasteners hold the neoprene covers in place. . Ideal for on-the-go fishing, our Tackle Satchel lets you bring along your favorite angling essentials with ease. Rugged 600-denier polyester construction withstands punishing seasons of use. Includes one 3700 tray. 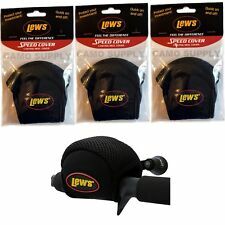 Lew's 4mm Neoprene Spinning Reel Cover Black Fits 300/400 Size Reels NEW. Lew’s Speed Cover reel cover for 300/400 size spinning reels. Safely protects your Lew's spinning reel while still on the rod. Tough stitched and zipper lock, this bag storage your pliers, fishing box, baits and lures, small reel and other accessories all secure and organized. Qty. : 40pcs spinners, 8pcs spoons, 6pcs SoftLures, 5pcs Crankbaits& 1pcs Popper. Open never use Offshore Angler Ocean Master Round and Spinning Fishing Reel Cover (Lot of 8). Ocean Master fishing reel covers are one of the leading reelprotector in the industry. The covers are not cheap, but the constructionmaterials they use provides maximum protection for your reels. 2018 Black Fishing Reel Pouch Bait casting Bag Protective Spinning Reel Cover V! The fly fishing reel bag can be used while the reel is attached to the rod. Loop tape fastener for easy storage or removal, well protecting your reel from shake. 1 x Fly Fishing Reel Bag. Color: Black & Blue(As the picture showed).